Christenings, or baptisms as they are often referred to, mostly take place at 12.00 noon on some Sundays after the morning service and sometimes during the 10am service. 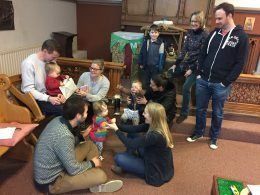 Christenings are delightful celebrations in which we enjoy welcoming your family in church. We also offer adult baptisms. Please contact Rev Anne Farmer or Jane Sachdev, our Children and Families’ worker.